Tricker pond in the summer of 2005. Tricker pond on 7/13/06, covered in salvinia. 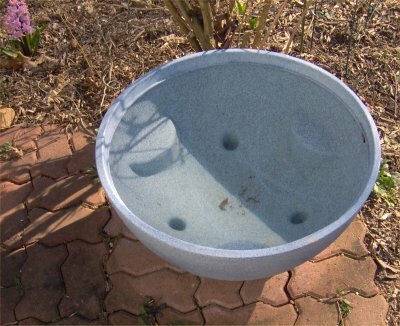 On 3/25/05, I received a 12 gallon "blue granite" tub pond that I ordered from Tricker. I got tired of my 12 gallon lotus tub pond so I wanted to put something else there on the bricks by my pond bench. It has three "shelves" in it but they are smaller than any pond pots I have ever seen so I am not sure to do with it yet. I thought the blue pond would look good but it really clashes with the natural colors around. I plan to use it for tropical plants. On 5/26/05, I put a floating leaf flower in the pond. The other plants that came that day, I waited three days to pot up. On 5/29/05, I potted up a Colorata tropical water lily into a one gallon pot (with dirt, fertilizer, and pea gravel) and put it in the bottom of the Tricker pond. It even had a few buds on it. In two tiny terrestrial plant pots, I potted up a dwarf papyrus in one and a hardy calla lily in the other. These pots I just filled with pea gravel because I knew the raccoon could not resist them. I was right. The next three nights, the pots were all dumped, knocked off their itty bitty shelves. After that, it seems maybe they might leave them alone (I am hoping!). I also added one anacharis (loose). A male green frog started hanging out in the pond on 6/1/05. I added some java moss to this pond from my 50 gallon aquarium on 6/4/05. At least one baby rosy barb was in there. On 6/17/05, I put in three goldfish fry that had grown to almost an inch after spending their first two months of life in plastic litter buckets. The goldfish will probably eat any rosy barbs which is okay since I have too many. On 10/9/05, I removed the waterlily (just one itty bitty leaf) and dwarf papyrus and put them into my basement pond for the winter after repotting them. The Tricker pond is 100% covered in salvinia so I cannot see what any remaining fish are up to. I know there are tadpoles in there. When it gets colder, I will have to sift through the rest of the pond. On 11/13/05, I removed everything from the Tricker pond and brought it inside for the winter. I put the anacharis and hornwort into my 153 gallon pond. I put one baby goldfish and a few hundred tadpoles into my 1800 gallon pond. You can read more about the process in my December 2005 newsletter. I set up the Tricker pond on 4/19/06. 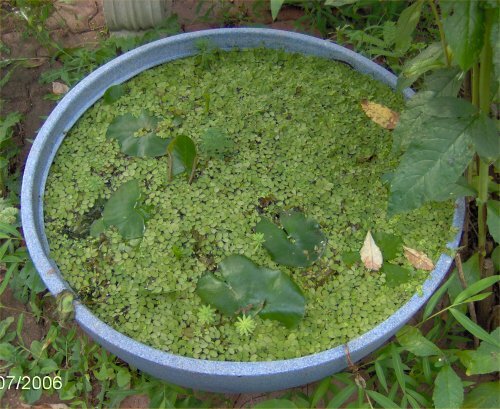 On 4/27/06, I put some salvinia in the Tricker pond. On 4/30/06, I potted up two small pots, one with a bunch of parrot feather and one with a tropical water poppy. 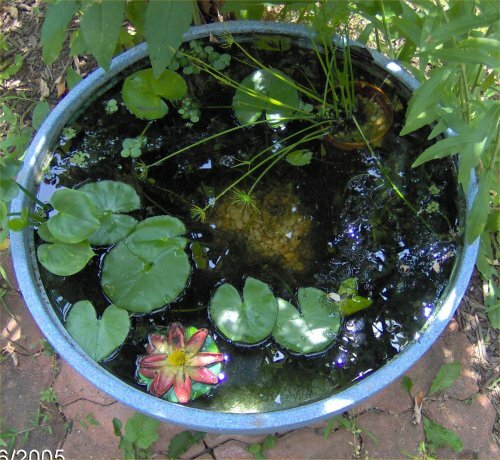 On 5/15/06, I put a barely alive tropical water lily in a 1 gallon pot in the bottom of the pond. The lily overwintered in my indoor pond. On 5/27/06, I put in 8 fry from either my 20 or 5 gallon tank. They are probably a new mystery danio but could be glowlight danios or paradise fish. If they live, I will report back. I added three more fry on 6/10/06. They were still swimming around a week later but then were hard to see as the floating plants are growing. I hope some make it! The barely alive lily is basically dead so I put a new Islamorada tropical lily in that pot on 5/28/06. The raccoons and green frogs dump the small pots almost every day. They are so unstable. I added two more Danio x (mystery danio) fry on 6/24/06. I cannot see any fry in there because the top of the pond is now covered in salvinia. I put out two more fry on 7/8/06. I put up the Tricker pond on 9/24/06. There were no fish and just a few dozen tadpoles and some snails left. All the water lilies were completely gone. You can read more about in the October 2006 newsletter. On 3/29/07, I put the Tricker pond back outside. I have not yet put anything in it (not even water). On 5/23/07, I filled up the Tricker pond with fresh water and put in some salvinia. I am not sure what else I might put in there. On 6/9/07, I put in one anacharis plant. On 7/15/07, I put a small solar fountain in the Tricker pond that was in the 50 gallon tub pond. The fountain only drizzles when full sun hits the panel so it does not do much at all. The plants in the pond are barely alive. I think the AlgaeFix is killing them. The pond's only real purpose this year is that the honeybees are drinking from it. I put up the Tricker pond for the winter on 9/23/07. I do not think I will set it up for 2008. I have not used it since.